The purpose of this paper is to bring to the notice of scholars a case of extraordinary resemblance between a megalithic pottery inscription of ca. first century BCE found at Sulur, near Coimbatore in Tamilnadu, South India, (and now in the British Museum, London), and a near-identical inscription on a miniature tablet from Harappa (and now in the collections of the Archaeological Survey of India, New Delhi). I am grateful to Dr.J.Robert Knox, formerly Keeper, Department of Oriental Antiquities in the British Museum, for the excellent photograph of the Sulur Dish (Fig.1). I also acknowledge my indebtness to Asko Parpola and the co-authors of the Corpus of Indus Seals and Inscriptions, vol. I, for the clear photograph of the miniature tablet from Harappa (Fig.2). Both objects have been published earlier; but the comparison between the two inscriptions is attempted here for the first time. 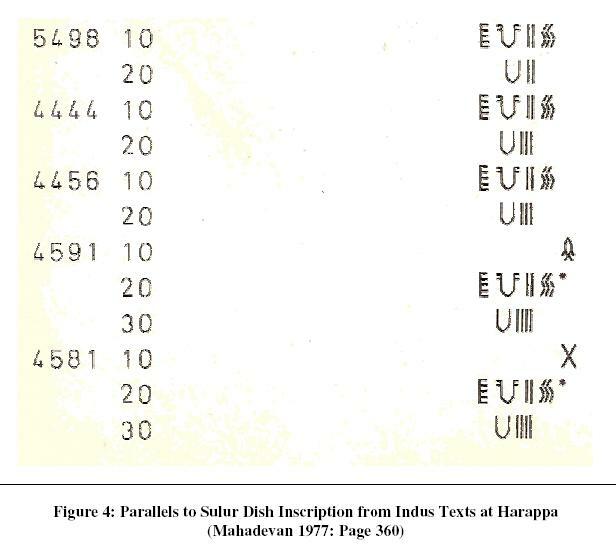 Some of the material in the present paper is taken from my earlier paper on the Sulur Dish (Mahadevan 2001) with some modifications on the basis of fresh appraisal. Indus sign numbers in two or three digits and four-digit Indus text numbers are from my book (Mahadevan 1977). Sulur is a well-known ancient site in Tamilnadu, which has yielded several antiquities including semi-precious stone beads, rouletted ware, punchmarked and Roman coins, assigned to the Late Megalithic-Iron Age and Early Historical Periods (Beck 1930; K.R.Srinivasan & N.R.Banerjee 1953; S.Suresh 2004). An inscribed terracotta dish from Sulur dated in ca. first century BCE is in the collections of the British Museum (Accession No.1935.4-19.15). The large, circular, grey terracotta dish is in an excellent state of preservation. It is incised on the concave inner side with a large X-like symbol occupying the whole field. Four other symbols in a smaller size are incised within the lower quadrant. The four symbols are so closely placed together as to give the appearance of a connected text. In my earlier paper, I had not considered the large X-like symbol as part of the inscription as I thought it was a decorative element in the background. I have since recognized that the X-like symbol 2 has also a parallel in an Indus sign (Mahadevan 2006) and should be counted as part of the inscription on the dish. A: A long, slanting, straight line with a pair of short strokes attached near either end of the line in opposite directions. 'Jar'. B: A slightly curved base line to the left, with a saw tooth-like line to the right. 'Harrow'. C: A tall V-shaped cup. 'Cup'. D: Three tall, vertical, parallel lines. 'Three tall lines'. E: X-like crossed lines occupying the field. 'X'. In my earlier paper (2001), I have compared the two pairs of symbols on the dish (AB and DC) with two near-identical pairs of Indus signs 'jar-harrow' and 'three tall lines-cup' (342-176 and 89-328 respectively) frequently found on the miniature tablets and sealings at Harappa. In the present paper, I take the comparison another step forward, showing that all the five megalithic symbols on the Sulur Dish have near-identical parallels occurring in the same order in a longer Indus text with seven signs on a miniature tablet from Harappa. The text 119-87-342-176 has many duplicates on the miniature tablets at Harappa. It is accompanied here on the second side by a text comprising a 'cup' preceded by 'four tall lines'. The sign X occupies the whole field on the third side. Symbol A is probably a variant of the Indus sign 342 ('jar'). Symbol B is identical with a variant of the Indus sign 176 ('harrow'). Symbol C is identical with the Indus sign 328 ('cup'). Symbol D is identical with the Indus sign 89 ('three tall lines'). Symbol E is identical with the Indus sign 137 ('X'). The first two signs 'rain drops-two tall lines' (119-87) on the Harappa tablet are not found on the Sulur Dish. The other five signs (spread over three sides of the tablet) have parallels on the Sulur Dish in the same order. However, the 'four tall lines' on the Harappa tablet is replaced by 'three tall lines' on the Sulur Dish. Further, while the pair 'jar-harrow' is written from right to left on both objects, the pair 'three/four tall lines-cup' occurs in opposite directions on the two objects as explained in my previous paper (2001). Such reversal of directions between these two pairs of Indus signs is not uncommon when they occur on different sides of the miniature tablets and sealings from Harappa (e.g.4602 & 5274). The Indus sign pair 'jar-harrow' (342-176) is almost always final; the 'jar' sign never occurs in the initial position. It is therefore likely that the corresponding pair of symbols (AB) on the Sulur Dish is preceded by the symbol 'X' corresponding to the Indus sign 137. The sequence 'X-jar' (137-342) is known to occur in an Indus Text (cf.1179). The occurrence of the symbol X in a larger size occupying the whole field on the Sulur Dish has its parallel on the Harappa tablets and sealings with the corresponding Indus sign 137 occupying the whole field on one of the sides (cf. 4581 & 5296). The closeness between the inscriptions on the Sulur Dish and the Harappa tablet is further emphasized by the occurrence of several other miniature tablets at Harappa, which share three or four signs analogous to the symbols on the Sulur Dish in the same order. The illustration in Fig.4 (reproduced 4 from Mahadevan 1977:360) shows parallel inscriptions with the same text of four Indus signs on one side and with the near-identical pairs of Indus signs on another side showing a 'cup' preceded by 'two, three or four tall lines'. When there is a third side, the Indus signs 'X' (No.137) or 'fish' (No.59) occupy the whole field (4581 & 4591 respectively). The megalithic symbols on the Sulur Dish are compared pictorially with the signs of the Indus script on the Harappa tablet with the help of photographic reproductions to avoid any subjective element. The paper also excludes any discussion on the language of the Indus Script or the meaning of individual Indus signs in order not to deflect attention from the crucial issue of the extraordinary resemblance between the signs on the Harappa tablet and the symbols on the Sulur Dish. The challenge posed by the comparison is to explain the resemblances. An easy way out is to consider the resemblances accidental or not close enough. My view is that these options are not open in view of the number and sequence of the symbols on the Sulur Dish and the corresponding Indus signs on the Harappa tablet. I suggest that such close resemblances are possible only if the South Indian Megalithic script is related to the Indus script. Further, the common sequences found on the Sulur Dish and the Harappa tablet may indicate that the languages of the two inscriptions are related to each other. Corpus of Indus Seals and Inscriptions. Vol.I :Collections in India.1987. (Eds.) J.P.Joshi & Asko Parpola. Helsinki. (Abbr. CISI-I). Mahadevan,Iravatham 1977.The Indus Script:Texts,Concordance and Tables. Archaeological Survey of India, New Delhi. (Abbr. IM 77). -------------- 2001. The Indus-like symbols on Megalithic Pottery: New Evidence. (In) Vidyarnavavandanam. Essays in honour of Asko Parpola. (Eds.) Klaus Karttunen & Petteri Koskikallio. Helsinki. -------------- 2006. Agricultural Terms in the Indus Script. Journal of Tamil Studies. No.70. pp.64-76. Parpola,Asko 1994. Deciphering the Indus Script. Cambridge University Press. Srinivasan,K.R.& N.R.Banerjee 1953. Survey of South Indian Megaliths. Ancient India 9:103-115. Suresh,S. 2004. Symbols of Trade: Roman and Pseudo-Roman objects found in India. New Delhi. 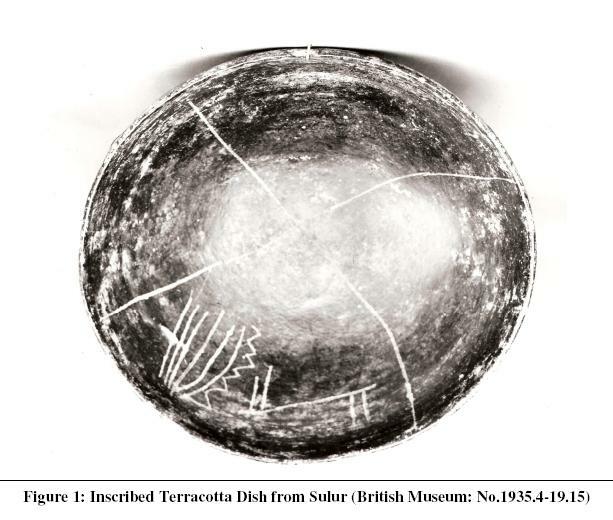 Figure 1 : Inscribed Terracotta Dish from Sulur. 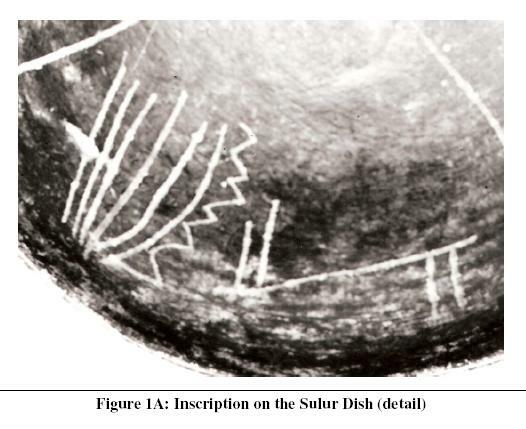 Figure 1A: Inscription on the Sulur Dish (detail). Figure 2 : Miniature Tablet from Harappa. 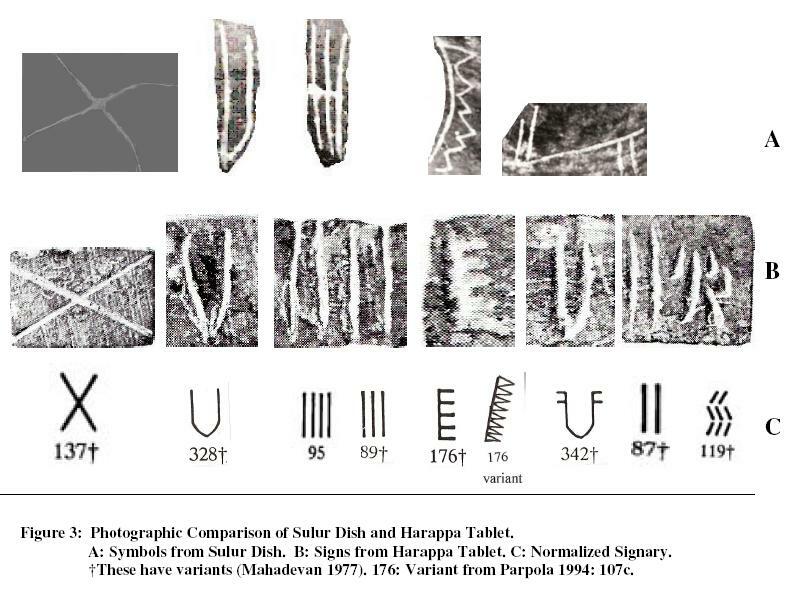 Figure 3 : Photographic comparison of Sulur Dish and Harappa Tablet. Figure 4 : Parallels to Sulur Dish inscription from Indus texts at Harappa.